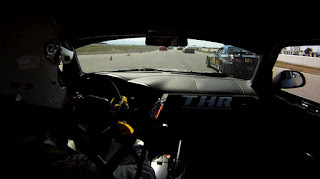 THR-W drivers Matt Staal and Lee Niffenegger continued their 2012 SCCA National season with a pair of class wins at Buttonwillow Raceway Park in their Honda Racing/HPD BFGoodrich machines. Staal ran uncontested in his Touring 3 Honda S2000 CR to claim valuable first-place points and complete his qualifications for the 2012 SCCA National Championship Runoffs. Niffenegger bested two other competitors in Showroom Stock B (SSB) to win the prized BFGoodrich Super Tour event on Sunday after missing the Saturday portion of the Double National. The Sunday event consisted of a late-morning qualifying session, followed by a late-afternoon race. The schedule worked out well for Niffenegger, who returned at 2:30 a.m. on Sunday morning from Miami, Florida after performing his official duties as HPD’s representative to the Grand-Am series and teams. Teammate Staal raced Saturday as well, finishing second in T3, and already had most of the support equipment at the track. Qualifying went without a hitch, as Staal continued to push the envelope in his adaptation to the rear-wheel-driven S2000. Niffenegger grabbed pole in SSB and the pair then went about its preparations for the afternoon session. In the race, Staal spent his time chasing a T2 class competitor setting his fastest times of the weekend. Niffenegger pulled away from the other SSB competitors to post his third race win of the season. The SCCA Southern Pacific Division Nationals season continues on the weekend of June 9-10 at Auto Club Speedway in Fontana, CA.